Haven entertainment passes are NOT included in the price. These can be purchased directly from Haven. Gas, electricity, water charges and duvets/pillows are included, please bring your own linen. Some dates available are flexible as to length of stay. Email with your date requirements. A £100 non refundable deposit secures your booking. A £50 breakage deposit will be added to the price of your holiday. This will be refunded within 1 week of the end of your stay provided the caravan is left in a good condition. NEW prices for 2019 now shown Saturday-Saturday bookings please message for Fri-Mon & Mon-Fri prices. 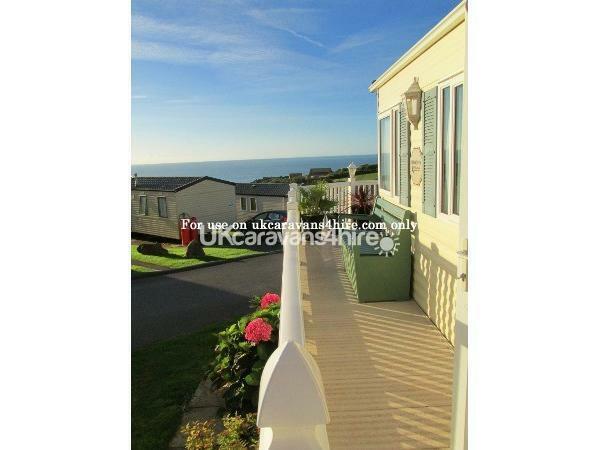 Our caravan 'Cliffs Corner' has a wrap around Veranda with gate for safety of children, table and chairs and a lovely panoramic view of the sea from our elevated corner position on Rowan Meadows at Devon Cliffs award winning holiday park, in a quiet area of the park but only a 5 minute walk from the complex. There is lots of parking areas including disabled right next to us and you can also pull up on to the grass at the kitchen door for easy unloading. From the Veranda leading through the french doors to the lounge you will find a free standing comfy 3 piece suite, electric fire, Free-view flat screen TV & DVD player & a stereo. The lounge is separated by a door to the kitchen/dining area giving seperate rooms just like at home & unusual in a caravan. The Kitchen/Diner has separate full size fridge & a full size freezer, gas oven & hob, kettle, toaster & microwave. All the kitchenware and utilities you require can be found to make it home from home!. A free standing table and 4 chairs for dining with full length window gives you a bright dining area. A door leads through to the hall for bedrooms allowing you to seperate the bedroom and living areas and an outside door leads back onto to the side of the Veranda. Ironing board, hairdryer, iron, clothes-airier, hoover are also found for your use. 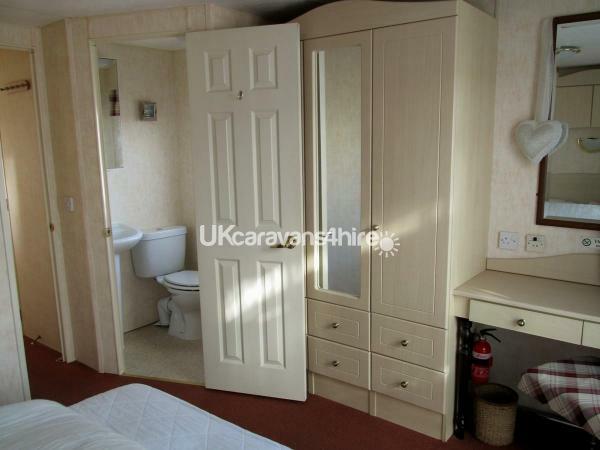 The main bathroom has a double shower, sink & toilet with plenty of shelving area behind the mirror. The larger than average double bedroom also has an en-suite toilet & sink and plenty of wardrobe space, vanity unit & drawer space as well as a freeview flat-screen TV. The twin bedroom has to 2 single beds that can be pushed together to make a double if required. With a Wardrobe and overhead storage space. We supply all duvets and pillows, please bring your own linen. New Duvets & Pillows have been purchased for 2019. We can also provide bed linen and beds made up for arrival for £25 if required. Devon Cliffs has a reputation for bad internet access so we have added our own INTERNET BOX ensuring you get full internet access at the caravan (does not work on site elsewhere) at a good speed and charge £20 a week for this, cheaper than the resort log in cost! We allow careful smokers on the outside veranda area. The main entertainment complex at Devon Cliffs is only a few minutes walk from the holiday home and there are main coastal path walk to either Exmouth or Budleigh Salterton. The surrounding areas have much to offer to the tourist from quiet parks and stately homes to fun packed theme parks. Please note that the site is closed over the Winter months. Our caravan is usually available from Mid March through to October half term holiday. During peak season we only take 7 day bookings or more. A £100 non refundable deposit secures your holiday date & full payment must be made 6 weeks before your arrival by cheque or bank transfer. A £50 security deposit is required and returned within 7 days of you vacating the property after we have ensured all is how you found it. Price is for accommodation only including all gas, electric and water and does not include Haven fun passes or activity bundles. Avoid the Q's in reception to collect keys for your caravan just head straight to ours and collect your keys at the front door from our key safe system! Access from 3pm on day of arrival and please leave by 10am on departure date to allow cleaners in. High rope activity, indoor/outdoor play area.